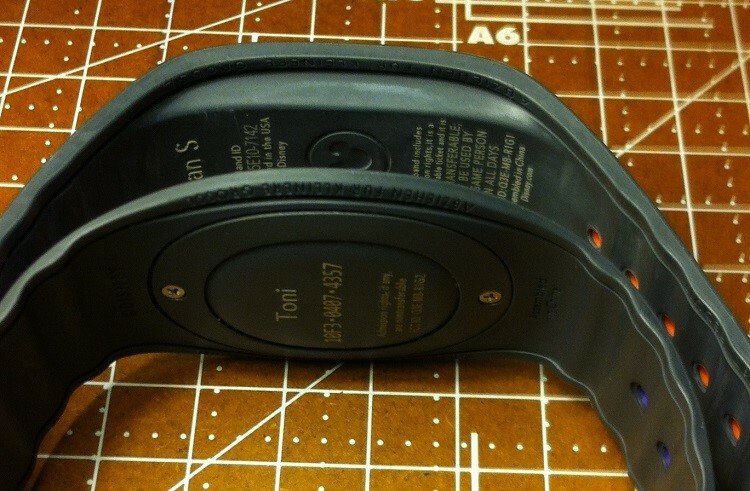 Is there a difference between the “New” Magic Bands and the “Old” Magic Bands? Disney recently made some changes to their Magic Bands, so we took a moment let’s compare the “old-style” bands to the latest version. 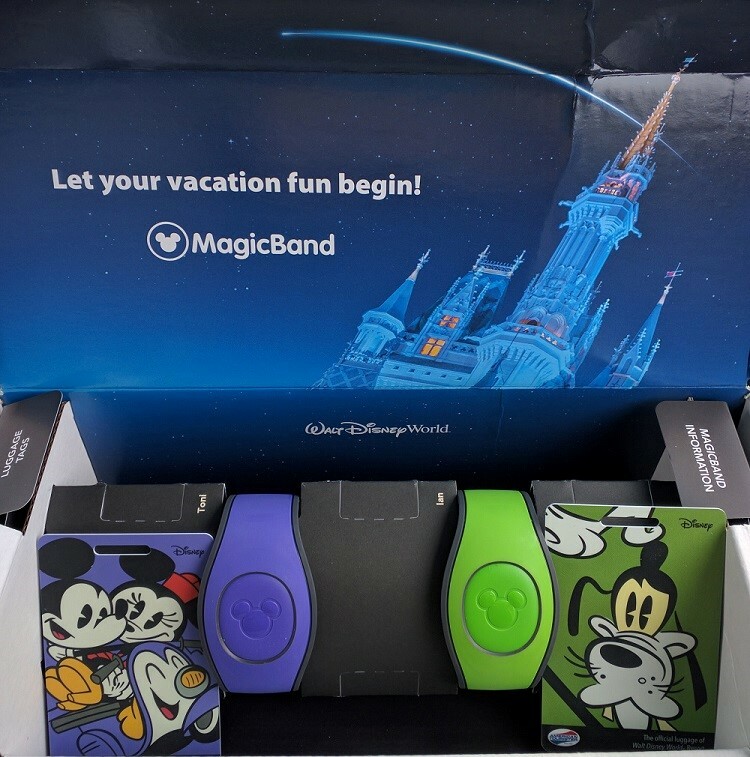 In case you don't know, MagicBands are included as part of Walt Disney World Resort room only reservations and vacation packages and are mailed to guests from the United States. Guests from other countries or guests who book less than a month prior to arrival will receive their MagicBands when they check in at their Disney resort. You will need to set up a MyDisneyExperience.com to link your resort reservation and tickets (if purchased separately) to your MagicBands. 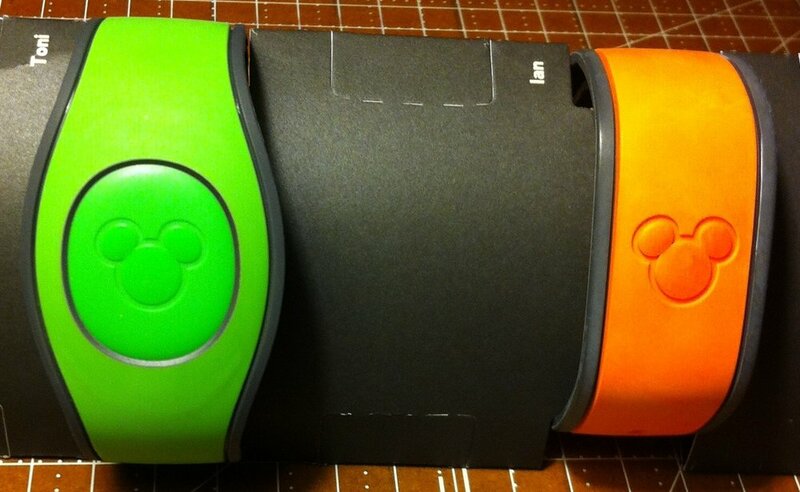 MagicBands can also be purchased at Disney World and online through the Disney Store. Guests not staying at a Walt Disney World Resort hotel can purchase MagicBands at Disney World or prior to their trip through the Disney Store. MagicBands can be reused on future trips and have a life expectancy of about two years before the enclosed battery dies. Here is a close-up of my “old-style” band from our 2013 trip. 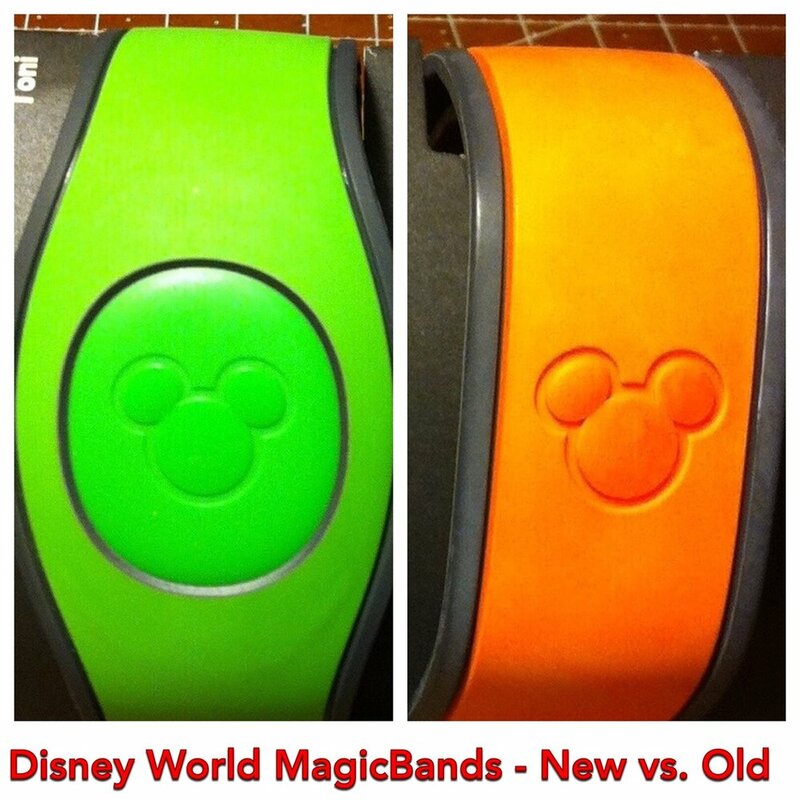 A Comparison of the the “New” and Old” Disney World Magic Bands - orange older style MagicBand. 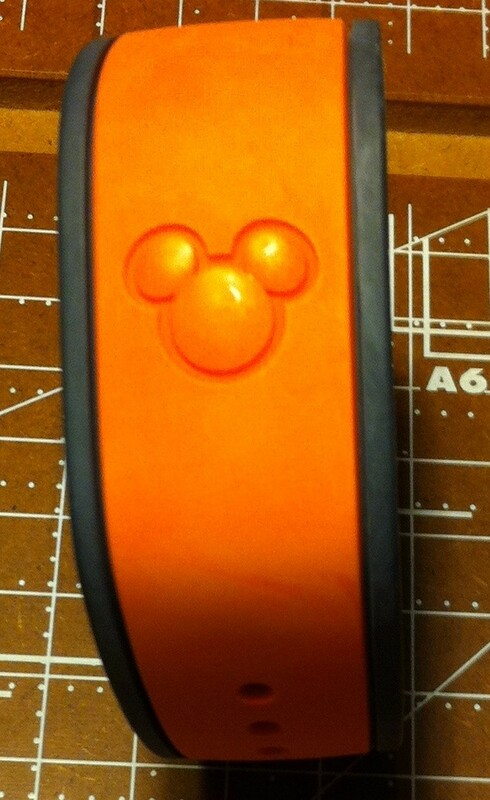 It’s their standard orange band, because they didn’t have the Little Orange Bird bands available yet. I am oddly fascinated by that bird, and the Anita Bryant song that accompanies it. Google it when you get time. Our new bands arrived today, so a side-by-side comparison was in order. A Comparison of the the “New” and Old” Disney World Magic Bands - The new bands with their matching Disney character luggage tags in the original packaging. Please take note of something – the luggage tags are cleverly packed with the magic bands, and color-coded to correspond with the matching guest. Pretty neat, right? Anyway, I put an old band next to a new band, and here’s what I found. First off, the one on the left is green. My first impression was that the new band is a bit wider. Toni’s first impression was that the new band is lighter. A quick “hold one in each hand” test yielded uncertain results, so I weighed them both on a triple-beam balance. Yes – I have one lying around. Don’t ask – the explanation is just too long. Turns out, she was absolutely correct. The old orange came in at 20.5 grams. The new green band actually showed a lighter 18.3 grams. Not much of a difference, but clearly enough to notice. A Comparison of the the “New” and Old” Disney World Magic Bands - the new bands are thinner than the old style MagicBands. A Comparison of the the “New” and Old” Disney World Magic Bands - the new bands are thinner. The bands have all of the same functionality as the old bands, plus another feature the old ones didn’t have – one particularly for those who aren’t too happy wearing a wristband. A Comparison of the the “New” and Old” Disney World Magic Bands - how to remove the puck from your Disney World MagicBand. The center of the band (called a “Puck”) can be removed. The puck can be kept in your pocket, or (coming soon!) on a key fob-type of device you can clip to whatever you may need. More updates on this feature as more information becomes available in the near future! One word of caution - the puck can get lost a LOT easier once it’s removed from the band. Personally, I’m leaving mine firmly attached. Like its predecessor, it’s even waterproof. 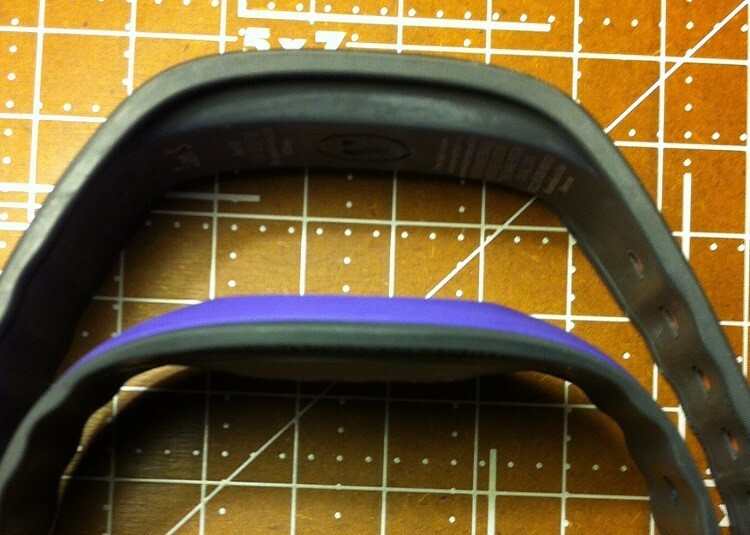 To conclude, the new bands are lighter, thinner, a tad wider, and appear just as comfortable. The new removable puck feature should be a delight to those who wish to avoid wearing anything on their wrist.